NORAD’s holiday tradition can by traced to 1955, when a Colorado Springs newspaper printed a Sears, Roebuck & Co. ad telling children of a phone number to talk to Santa. The number was one digit off, and the first child to get through reached the Continental Air Defense Command, NORAD’s predecessor. Col. Harry W. Shoup answered. Shoup’s daughter, Terri Van Keuren, said her dad, now 91, was surprised to hear that the little voice on the other end thought he was Santa. “Dad thought, `What the heck? This must be some kind of code,'” said Van Keuren, 59. Shoup, described by his daughter as “just a nut about Christmas,” didn’t want to break the boy’s heart, so he sounded a booming “Ho, ho, ho!” and pretended to be Santa Claus. Enough calls followed that Shoup assigned an officer to answer them while the problem was fixed. But Shoup and the staff he was directing to “locate” Santa on radar ended up embracing the idea. NORAD picked up the tradition when it was formed 50 years ago. Also, since we’re using the generate scaffold command, we should remove unused code when refactoring as suggested in the original Four Days on Rails tutorial. I’ll also be using RCov to look at how much the feature description covers the code. I think this is a helpful way of digging into what the scaffold command actually did. This tutorial picks up where day 3 finished. You can skip day 1 or 2, if you already have installed Ruby on Rails and know a little bit about it. Second, you’ll need to open up the cucumber generated task file and set the rcov config option (add one line in bold). It is unsurprising that we’re covering just 40% of this file, since we’ve written just a single of scenario so far. Let’s look at what isn’t getting covered. When I follow "New task"
When I fill in "description" with "go shopping"
Then I should see "Task was successfully created." And I should see "go shopping"
You’ll see that all of the new steps that I just wrote for the “add a Task” scenario magically worked. What just happened? You can see from the output of “rake features” that the first step was already defined in tasklist_steps.rb (see day 3), but each of the others is defined in webrat_steps.rb. With a little practice you’ll learn the webrat lingo, and it’ll save you a bunch of time. Pretty cool, huh? 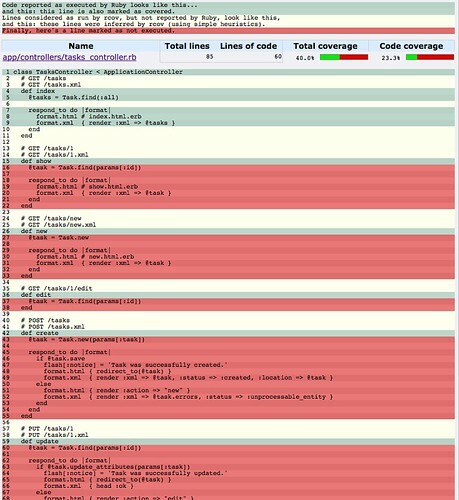 Now if we go back to look at our code coverage (http://localhost/todolist/coverage/), the tasks_controller.rb coverage is at 64.7%. 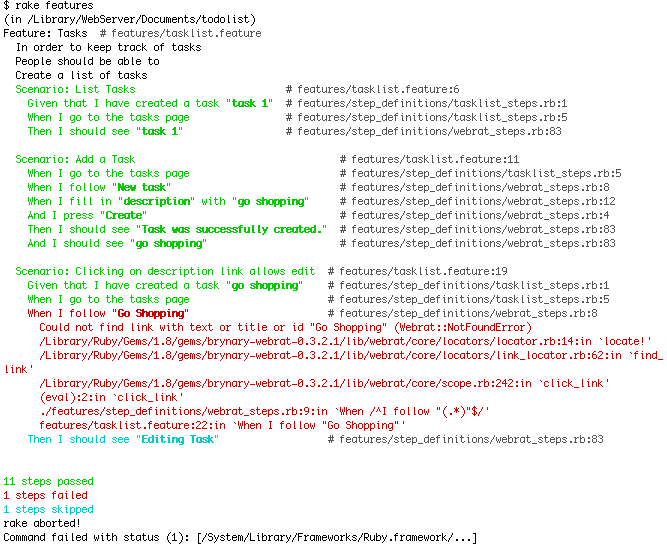 Given that I have created a task "go shopping"
When I follow "Go Shopping"
Then I should see "Editing Task"
As you can see that I’ve modified line 10 to link the description to the edit task page. Note that (h task.description) needs to be enclosed in parens. We want to keep the h, just to make sure that the description is properly escaped, in case it has special characters like ‘<'. I also removed show and edit links. Now, when I run 'rake features' all of my steps pass. Yay! But wait! I still have the “show” method in my controller. What’s up with that? If I look at my coverage report, it shows that it is being called. In my controller, both create and update redirect to @task (which is the “show” page), like I did in day 2, I’ll modify those to redirect to index instead. Rerun ‘rake features’ just to make sure all is good. And you can now see that the tasks_controller code coverage is at 62%. We’re calling edit, but not yet update… on to the next scenario. And I fill in "description" with "buy bagels"
Then I should see "Task was successfully updated." And I should see "Listing tasks"
And I should see "buy bagels"
When I run “rake features” the scenario passes. (Yay!) I don’t know how to hit the error condition in update either, but I’ll leave that for another day. I left delete for last since it is a bit trickier. With the design of the app, there is a “destroy” link for each task in the list, so I have to figure out which one to click. Given that I have created a task "task 1"
And I click "delete" for "task 1"
Then I should see "Listing tasks"
And I should not see "task 1"
To make this work, I can define a unique DOM id for each of my table row, then I can find the id for “task 1” and then click the link inside that table row. In app/views/tasks/index.html.erb, we have some Ruby code which iterates through the list of tasks (@tasks) and for each ‘task’ there is a table row. To add a unique id for the table row, I insert a snippet of ruby code within <% … %> which evaluates to a unique string. In this case I use the string “task” plus to id of the task itself, generating task4, task5 or whatever. to get the task object where the description attribute matches the given parameter. Now that the feature description roughly covers the functionality of our app, I sought to take Matt’s advice and look at the code and see if we need to remove some duplication. The index and new methods repeat code, but the edit method, which I would expect to contain the same repeated 4 lines omits the code. In fact, if I remove those lines in index and new, the app works fine. When I run ‘rake features’ all the steps pass and poking at the application also yields success. What’s going on? There must be something happening by default. At first I couldn’t figure out where ApplicationController was defined, but an answer to my question on the Rails list pointed out that ApplicationController is one of the classes created by generate scaffold (defined in app/controllers/application.rb). Looking at the code (and comments) we can see that it simply sets some defaults for any controller in the application. ApplicationController is a subclass of ActionController::Base, which we can look up in the Rails API Doc. The doc explains that “Actions, by default, render a template in the app/views directory corresponding to the name of the controller and action after executing code in the action.” I suppose the extra code is in there to facilitate modifying it, in case we wanted the action to do something special. Adding attributes and other models: do I scaffold again or just write code?